(MENAFN - Muscat Daily) Oman's growing stature as world-class sports venue has not just impressed the visiting players but also leading sports administrators of the world. And the latest to join the bandwagon, who have praised Oman as a top-class venue is none other than the International Table Tennis Federation (ITTF) supremo Thomas Weikert. 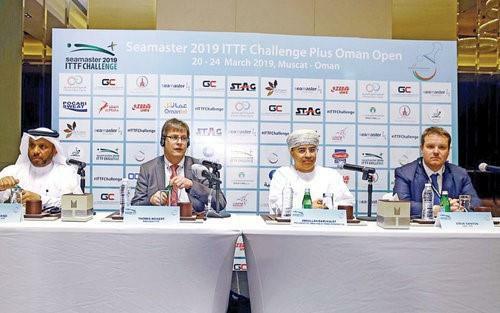 Weikert, who arrived on Friday to attend the 2019 ITTF Challenge Plus Oman Open, which concluded on Sunday, said that 'the sultanate is ready to host much bigger international tournaments'. The 2019 ITTF Challenge Plus Oman Open, which attracted more than 160 paddlers from 40 countries, is by far the biggest international table tennis tournament to be organised in the sultanate. Weikert said, 'Oman is destined for much more bigger events in the future. The ITTF Challenge Plus Oman Open has been very well-organised and the fantastic playing conditions and other facilities have left players and officials all impressed. And it could host a big one as Oman is one of the three countries that have had their bids for the 2022 World Veteran Championships shortlisted. The winning bid for the 21st edition of the hugely popular tournament will be decided next month at the 2019 World Championships in Budapest, Hungary next month [April 21-28] when the ITTF annual general meeting will be held. Besides Oman, the other two countries in fray are South Korea and Malaysia. 'We visited the proposed venue for the championships – Oman Convention & Exhibition Centre (OCEC) – and were happy with the plans to accommodate 200 tables. It is going to also help in bring lot of revenue for the country as the veterans tend to spend holidays along with their families during the tournament. Oman is a strong contender as it ticks all the boxes required to host the world meet,' said the ITTF boss. The ITTF supremo said it would continue to provide assistance to the Oman Table Tennis Committee (OTTC). 'We have been helping the OTTC, which has been doing a great job under Abdullah Bamkhalef, with equipments over the past couple of years and now we would try to send top coaches for clinics and workshops here,' he said. Steve Dainton, the CEO of the world governing body, said, 'The aim is to popularise the game across the world and ITTF has managed to take the game to 226 countries. The CEO said that 'Oman has all the ingredients to host bigger events including the world championships in future'. Also present on the occasion was Khalid al Mohannadi, the ITTF vice-president and chief of the Arab federation and Qatar Table Tennis Association. Mohannadi said, 'Oman has made significant strides in the sport. It has successfully hosted ITTF Challenge Plus and then in August it will host the International Hopes (U12) Week in Salalah during the khareef season.